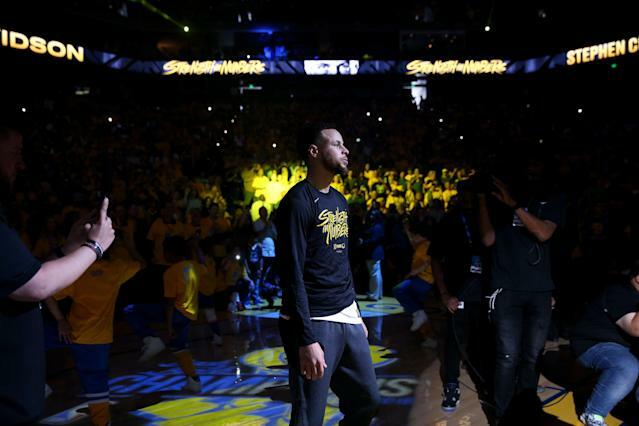 The Golden State Warriors are on a crash course with history as they attempt to make a fifth straight NBA Finals and win a third consecutive title. If they complete another championship, they will have done it in the franchise’s final season in Oakland, which would be the perfect send-off for a city they’ve nearly spent five decades in. The Warriors have made a big effort to celebrate the end of an era at Oracle Arena, and players are getting sentimental. In a wide-ranging interview with CBS’s “60 Minutes,” the team talked about what the city has meant to them. Are the Warriors sentimental about leaving Oakland for San Francisco? The Warriors first played in Oakland in 1966 and have stayed in the arena since 1971. However, new ownership broke ground on a billion-dollar arena in 2016 that will move the team across the Bay to San Francisco for the 2019-20 season. Generations of fans in Oakland have grown up being able to walk to games and feel a part of the community through thick and thin. That has led to a very mixed reaction to the move among fans and players. The Warriors aren’t lacking for motivation this year. There’s a feeling that this could be the last go-around with this group since Kevin Durant, Thompson and DeMarcus Cousins are all set to hit free agency. Giving Oakland one last championship would be an admirable goal, and doing it in Oakland would be even sweeter. The Warriors have clinched only one of their three championships at Oracle Arena; their 2015 and 2018 championships were both won in Cleveland. Head coach Steve Kerr is of the same mindset. The final game at Oracle Arena will come whether they like it or not, so leaving as champions is the best way to end things. “It's our last year at Oracle,” Kerr said. “It's our last year in Oakland. And this city has been really special to us and to the Warriors for the last four decades or so. “[Winning it] is the goal."